This swim is not for novices. This event is for experienced open-water swimmers only. You should be able to swim one mile comfortably in a pool in under 40 minutes. If you need advice, support, and coaching for this swim, Water World Swim can help. Registered swimmers will receive an email 1-2 weeks prior to race day confirming conditions, temperatures, times, locations, parking options, etc. Passenger space, if available, will be made available for registration and announced in that email as well. We cannot guarantee passenger space and any made available is first come, first served. 7:00 am Jump in the water. 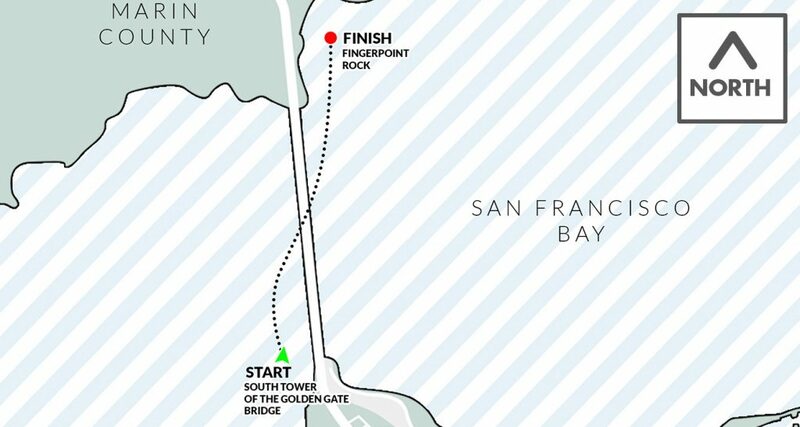 Finish line will be at Fingerpoint Rock. Swimmers will board the boat again after finishing to return to the wharf by 10:00am. How was Golden Gate Bridge?